Crystal Faison-Mitchell officially joined Moving in the Spirit in 2015 after serving as a volunteer, mentor, and choreographer for the organization since 2007. 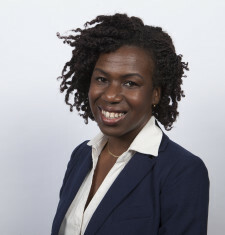 With a professional background in human resources, mental health counseling, and program management, Crystal’s previous positions have included: Assistant Director of Business Operations for the SEED School of Washington, DC; Training and Development Specialist for the State of Georgia; Human Resources Business Partner for MarketSource, Inc. She has also served as an organizational consultant for several small businesses and mental health agencies in Raleigh-Durham, NC. In her breadth of roles, Crystal’s main focus is working collaboratively in an effort to transform individual potential into collective success. Her love for the arts, specifically her love of dance, has inspired her compassionate, holistic approach to building strong teams. Crystal holds a BA in dance studies from The George Washington University and is currently pursuing her PhD in human development from Fielding Graduate University.